As he burned with the desire to devote himself entirely to the salvation of his neighbour, he aspired with all his heart to the priesthood. In this spirit he began in October, 1628, his theological studies. The four years he was supposed to devote to them seemed to him so very long that he finally begged his superiors to shorten the term. This request was granted, and in consequenceFrancis said his first Mass on Trinity Sunday, 15 June, 1631; but on the other hand, in conformity with the statutes of his order, which require the full course of study, he was not admitted to the solemn profession of the four vows. The plague was at that time raging in Toulouse. The new priest hastened to lavish on the unfortunate victims the first-fruits of his apostolate. In the beginning of 1632, after having reconciled family differences at Fontcouverte, his birthplace, and having resumed for some weeks a class in grammar at Pamiers, he was definitively set to work by his superiors at the hard labour of the missions. This became the work of the last ten years of his life. It is impossible to enumerate the cities and localities which were the scene of his zeal. On this subject the reader must consult his modern biographer, Father de Curley, who has succeeded best in reconstructing the itinerary of the holy man. We need only mention that from May, 1632, to Sept., 1634, his head-quarters were at the Jesuit college of Montpellier, and here he laboured for the conversion of the Huguenots, visiting the hospitals, assisting the needy, withdrawing from vice wayward girls and women, and preaching Catholic doctrine with tireless zeal to children and the poor. Later (1633-40) he evangelized more than fifty districts in le Vivarais, le Forez, and le Velay. He displayed everywhere the same spirit, the same intrepidity, which were rewarded by the most striking conversions. "Everybody", wrote the rector of Montpellier to the general of the Jesuits, "agrees that Father Regis has a marvellous talent for the Missions" (Daubenton, "La vie du B. Jean-François Régis", ed. 1716, p. 73). But not everyone appreciated the transports of his zeal. He was reproached in certain quarters with being impetuous and meddlesome, with troubling the peace of families by an indiscreet charity, with preaching not evangelical sermons, but satires and invectives which converted no one. Some priests, who felt their own manner of life rebuked, determined to ruin him, and therefore denounced him to the Bishop of Viviers. They had laid their plot with such perfidy and cunning that the bishop permitted himself to be prejudiced for a time. But it was only a passing cloud. The influence of the best people on the one hand, and on the other the patience and humility of the saint, soon succeeded in confounding the calumny and caused the discreet and enlightened ardour of Regis to shine forth with renewed splendour (Daubenton, loc. dit., 67- 73). Less moderate indeed was his love of mortification, which he practiced with extreme rigour on all occasions, without ruffling in the least his evenness of temper. As he returned to the house one evening after a hard day's toil, one of his confrères laughingly asked: "Well, Father Regis, speaking candidly, are you not very tired?" "No", he replied, "I am as fresh as a rose." He then took only a bowl of milk and a little fruit, which usually constituted both his dinner and supper, and finally, after long hours of prayer, lay down on the floor of his room, the only bed he knew. He desired ardently to go to Canada, which at that time was one of the missions of the Society of Jesus where one ran the greatest risks. Having been refused, he finally sought and obtained from the general permission to spend six months of the year, and those the terrible months of winter, on the missions of the society. The remainder of the time he devoted to the most thankless labour in the cities, especially to the rescue of public women, whom he helped to persevere after their conversion by opening refuges for them, where they found honest means of livelihood. This most delicate of tasks absorbed a great part of his time and caused him many annoyances, but his strength of soul was above the dangers which he ran. Dissolute men often presented a pistol at him or held a dagger to his throat. He did not even change colour, and the brightness of his countenance, his fearlessness, and the power of his words caused them to drop the weapons from their hands. He was more sensitive to that opposition which occasionally proceeded from those who should have seconded his courage. His work among penitents urged his zeal to enormous undertakings. His superiors, as his first biographers candidly state, did not always share his optimism, or rather his unshaken faith in Providence, and it sometimes happened that they were alarmed at his charitable projects and manifested to him their disapproval. This was the cross which caused the saint the greatest suffering, but it was sufficient for him that obedience spoke: he silenced all the murmurs of human nature, and abandoned his most cherished designs. 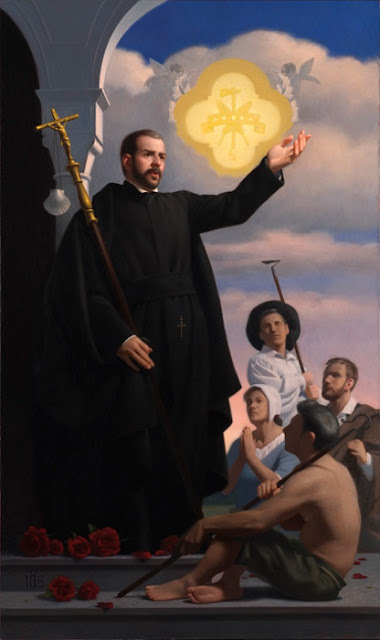 Seventy-two years after his death a French ecclesiastic, who believed he had a grievance against the Jesuits, circulated the legend that towards the end of his life St. John Francis Regis had been expelled from the Society of Jesus. Many different accounts were given, but finally the enemies of the Jesuits settled on the version that the letter of the general announcing to John his dismissal was sent from Rome, but that it was late in reaching its destination, only arriving some days after the death of the saint. This calumny will not stand the slightest examination. (For its refutation see de Curley, "St. Jean-François Régis", 336-51; more briefly and completely in "Analecta Bollandiana", XIII, 78-9.) It was in the depth of winter, at la Louvesc, a poor hamlet of the mountains of Ardèche, after having spent with heroic courage the little strength that he had left, and while he was contemplating the conversion of the Cévennes, that the saint's death occurred, on 30 December, 1640. There was no delay in ordering canonical investigations. On 18 May, 1716, the decree of beatification was issued by Clement XI. On 5 April, 1737, Clement XII promulgated the decree of canonization. Benedict XIV established the feast-day for 16 June. But immediately after his death Regis was venerated as a saint. Pilgrims came in crowds to his tomb, and since then the concourse has only grown. Mention must be made of the fact that a visit made in 1804 to the blessed remains of the Apostle of Vivarais was the beginning of the vocation of the Blessed Curé of Ars, Jean-Baptiste Vianney, whom the Church has raised in his turn to her altars. "Everything good that I have done", he said when dying, "I owe to him" (de Curley, op. cit., 371). The place where Regis died has been transformed into a mortuary chapel. Near by is a spring of fresh water to which those who are devoted to St. John Francis Regis attribute miraculous cures through his intercession. The old church of la Louvesc has received (1888) the title and privileges of a basilica. On this sacred site was founded in the beginning of the nineteenth century the Institute of the Sisters of St. Regis, or Sisters of Retreat, better known under the name of the Religious of the Cenacle; and it was the memory of his merciful zeal in behalf of so many unfortunate fallen women that gave rise to the now flourishing work of St. Francis Regis, which is to provide for the poor and working people who wish to marry, and which is chiefly concerned with bringing illegitimate unions into conformity with Divine and human laws.